This November, as Americans from across the country head to the polls, another election will be taking place. The American Society for Public Administration’s membership will vote in candidates for a variety of National Council positions. National Council positions are voted on annually, with individuals elected as Vice President serving four-year terms as they move through leadership posts: Vice President, President Elect, President and Immediate Past President. District Representatives and the International Director each serve three-year terms and the Student Representative serves for one year. Below you can see the list of candidates selected by this year’s Nominating Committee to run for office. You can also find more information about each candidate on the ASPA website. Voting will begin on Nov. 7 when ballots are distributed electronically. Paper ballots will be mailed to those who request them. 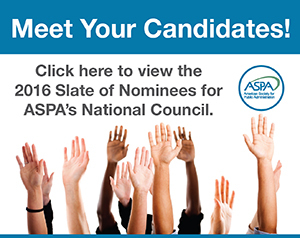 Only ASPA members may vote. If you are not a current ASPA member and wish to renew or reinstate your membership, please contact us ([email protected]) for assistance.